This scholarship is in honor of Eagle Scout Ryan Michael Adams. It will be awarded to the Eagle Scout(s) who best exemplifies the type of person, scout and student Ryan was. Boys from troops in Connecticut who are current high school seniors or who graduated from high school in 2015 (Ryan’s graduation year) or later and who achieved the rank of Eagle Scout are eligible to apply. The scholarship award is based on merit and will be up to $5,000. Most years will have one recipient. However, it is possible to have more than one recipient or no recipient, based on the applications received. Applications must be postmarked by July 1, 2018. Recipient(s) will be announced on September 13, 2018 (Ryan’s birthday). We lost Ryan on Sunday, September 20, 2015, just seven days after his 18th birthday. He was the innocent passenger in a tragic plane crash. Ryan attended Ridgefield public schools through seventh grade, and then transferred to and graduated from St. Luke’s School in New Canaan. Four weeks prior to the accident that took his life, Ryan started what was to be a promising college career at Colgate University in Hamilton, New York, his mother’s alma mater. Anyone who had the privilege of knowing Ryan can attest to what a truly remarkable person he was. Ryan had so much promise. Ryan was a Ridgefield Boy Scout since first grade where he was an active member of Cub Scout Pack 124 and Boy Scout Troops 116 and 76. From the start, Ryan made his mark in scouts. He rose to every challenge and excelled in all aspects of scouting. Most notably, Ryan earned the highly-coveted rank of Eagle Scout on May 16, 2011 in eighth grade at the young age of 13. Ryan was elected by his fellow scouts to the Order of the Arrow, Scouting’s honor society. He held numerous leadership positions in the troop, including Senior Patrol Leader (highest scout position in the troop), seven terms as Assistant Senior Patrol Leader, two terms as Troop Guide, and Patrol Leader. In addition, he earned four Eagle Palm awards, and the Pope Pius XII and Ad Altare Dei Religious Emblem awards. In the spring of 2015, he was awarded the Connecticut Eagle Scout of the Year by the American Legion and Connecticut Scout of the Year by the VFW, sponsored by Danbury Post 149. Ryan was an outdoor enthusiast and pursued these interests with the same heart and passion that he devoted to scouts. Ryan obtained his PADI Open Water Scuba certification in Honduras with his cousin and then had the opportunity to dive the Great Barrier Reef in Australia while on a trip with his parents and sister. Ryan also obtained U.S. Sailing certifications for Keelboat, Cruising, Bareboat Cruising and Catamarans. He was a member of the crew of the Tenacity, sailing out of Rowayton, Connecticut. Ryan’s other outdoor interests included backpacking, surfing, skiing, whitewater rafting and rock climbing. 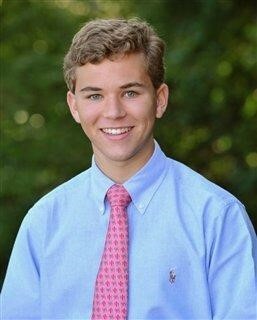 Ryan was an avid golfer and played on the Varsity golf team at St. Luke’s for four years. He caddied at Silver Springs and Waccabuc Country Clubs. Ryan’s most recent love was squash. He joined the Varsity squash team at St. Luke’s in his senior year, after playing three years of Varsity Ice Hockey. At Colgate, he enjoyed playing squash with his new friends and was planning on playing on the club team. Also at St. Luke’s, Ryan was the Founder and President of the Support our Soldiers Club and the Vice President of the Investment Club. And in addition to his many other interests, Ryan played the piano and trumpet. Ryan was a true academic. He loved to learn for learning’s sake. He was a voracious reader, particularly about World War II and Finance. Ryan loved to travel and wanted to see the world. He planned on doing two study groups abroad in college. Ryan intended on double majoring in Economics and International Relations at Colgate and was already taking three courses toward his double major. His interest in finance began at St. Luke’s where he did his senior thesis on identifying a correlation between U.S. economic factors and those of developed market economies, and he created a model to predict the growth of developing and emerging markets which earned him a STEM distinction. Ryan hoped to work on Wall Street and was already working with the Colgate Career Planning Office to obtain a summer internship. Ryan was a Connecticut Boys’ State delegate in June 2014, sponsored by Ridgefield American Legion Post 78. Ryan was elected Boys’ State Treasurer and received the Stempick Award. He returned as a Junior Leader in June 2015. Ryan was also the Treasurer and Chief Financial Officer of the Connecticut Boys’ State Foundation. Ryan was a member of St. Mary’s Parish. He taught a first-grade religious education class with his mother and sister. He was also a Eucharistic Minister and brought Holy Communion to the homebound. Ryan was a truly remarkable person. He was smart, ambitious, hard-working, and tenacious. But above all else, Ryan was good-natured, kind and thoughtful. Caring about other people was second-nature for Ryan. We will never know what else Ryan would have accomplished. But given Ryan’s varied achievements and his impeccable character, we have no doubt that had his life not been stolen from him, Ryan would have done great things.